I have the solution to all of your holiday problems right here. Looking for something fun and cute to add to your holiday cookie plates? Oreo Reindeer Pops. Need a teacher gift that’s easy and inexpensive? Oreo Reindeer Pops. Stumped as to how to keep your kids occupied during winter break? 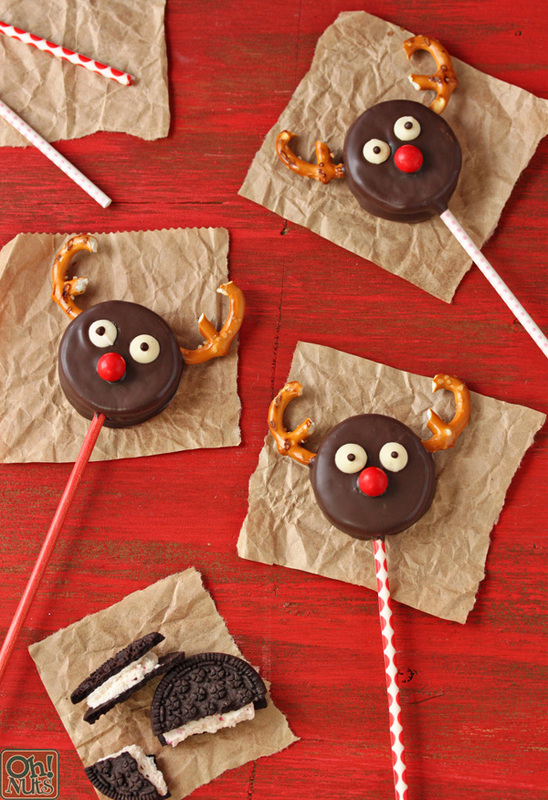 Oreo Reindeer Pops. 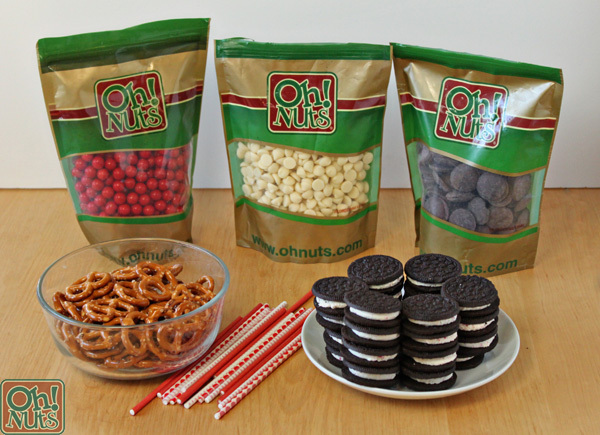 Wondering what to put in those party goody bags? 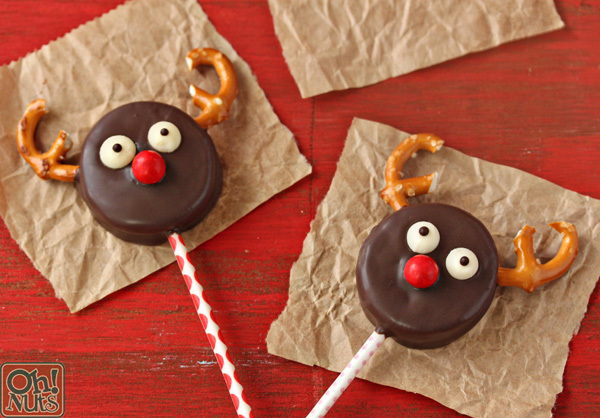 Say it with me now: Oreo Reindeer Pops! Okay, so these cute candies may not solve all of your holiday problems–heaven knows they can’t keep Aunt Gladys from telling the same boring stories over and over again–but they come pretty close! This is such an easy, fun recipe, you’ll find yourself making them again and again, for all sorts of different occasions. I used cookies with a minty candy cane filling, to really reinforce the seasonal connection–plus, minty sandwich cookies are just really delicious. 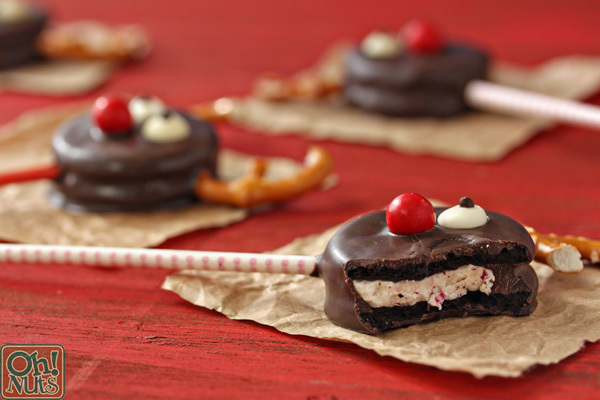 But they’re equally good with other flavors of cookies, and you can also substitute different candies for the nose, or try using chocolate-covered pretzels instead of plain pretzels for the antlers. However you decide to assemble them, you and your lucky family are sure to love them! 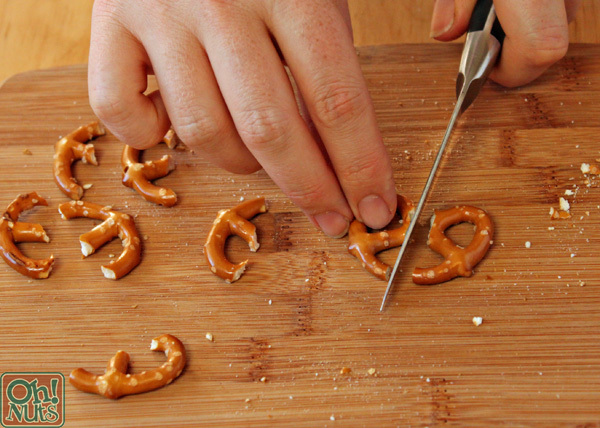 Start by cutting up the pretzels. Use a sharp knife to cut them in half, then carefully cut away the center section where the pretzels were joined–this gives you two pieces that each have 3 prongs. Be careful during the step, because the pretzel halves are delicate and will easily break. Repeat until you have 24 sets of pretzel antlers. Melt the chocolate melting wafers in a medium bowl in the microwave, stirring after every 30 seconds to prevent overheating. 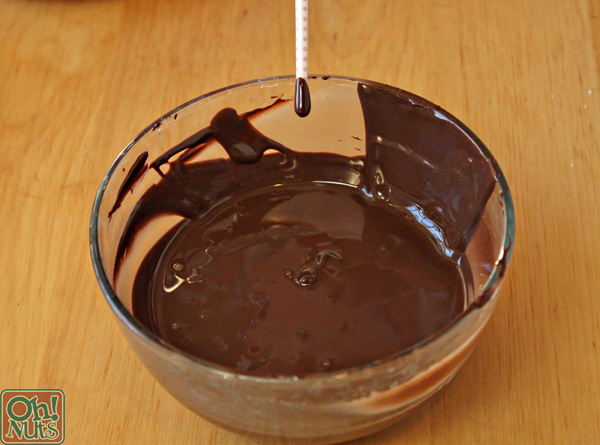 Once it’s melted and smooth, dip the tip of a lollipop stick in the melted chocolate. 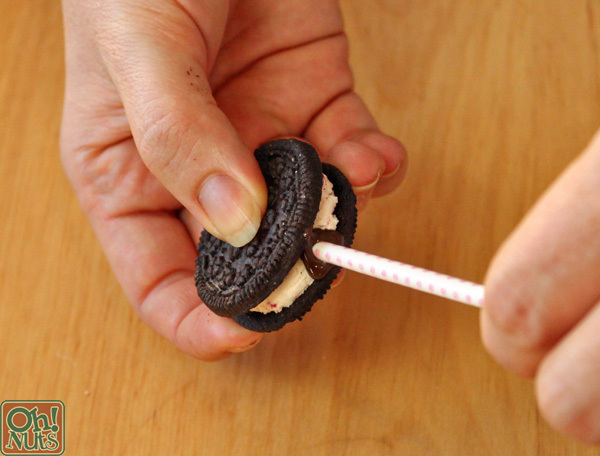 Carefully insert the chocolate tip into the creamy center of a sandwich cookie, so that it extends up at least 1/2-inch. Place it on a baking sheet lined with parchment or waxed paper, and repeat until all of the cookies are skewered. Refrigerate the tray for 5-10 minutes, until the chocolate is set. If necessary, briefly re-warm the chocolate in the microwave until it is smooth and fluid. 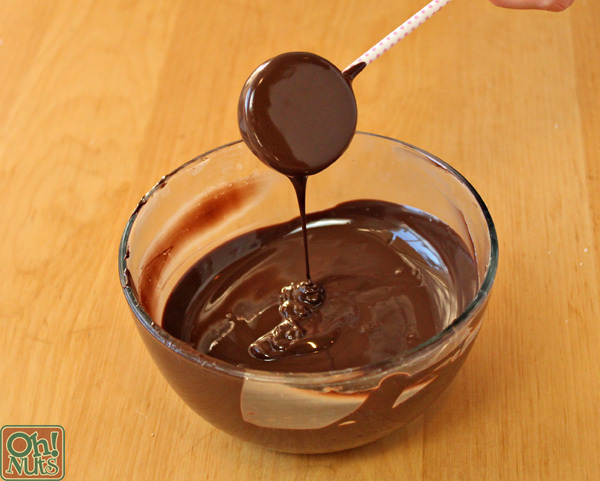 Hold the base of a lollipop stick, and dip a cookie in the chocolate until it is completely coated, then hold it over the bowl so the chocolate can drip back down. Lightly scrape the bottom of the cookie on the lip of the bowl, to remove any excess, then place the dipped cookie back on the baking sheet. While the coating is still wet, press a red sixlet into the center of the cookie. Next add two white chocolate chips above the sixlet for eyes. Add two pretzel antlers, pressing them between the cookies and into the space where the cream filling is. After you’ve assembled one reindeer this way, repeat until all of the cookies are dipped and decorated. 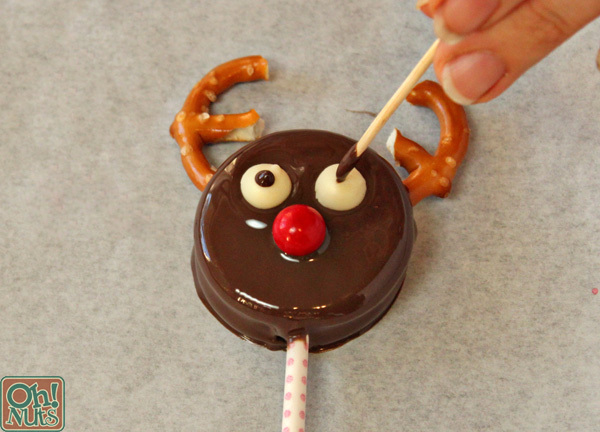 Finally, dip a toothpick in the melted coating and give each reindeer two black dots in the center of their white eyes. And that’s it! Your Oreo Reindeer Pops are finished. Store them carefully in an airtight container at room temperature. They will keep for several weeks, but for the best taste and texture, enjoy them within a week–the cookie and pretzels do start to taste a little stale after that. As always, printable directions and a pin-able tutorial are down below. Cut the pretzels in half, then use a light sawing motion to cut off the piece in the center where the halves were joined. (Be careful during the step, because the pretzel halves will easily break.) Repeat until you have 24 sets of pretzel antlers. Melt the chocolate wafers in the microwave, stirring after ever 30 seconds to prevent overheating. 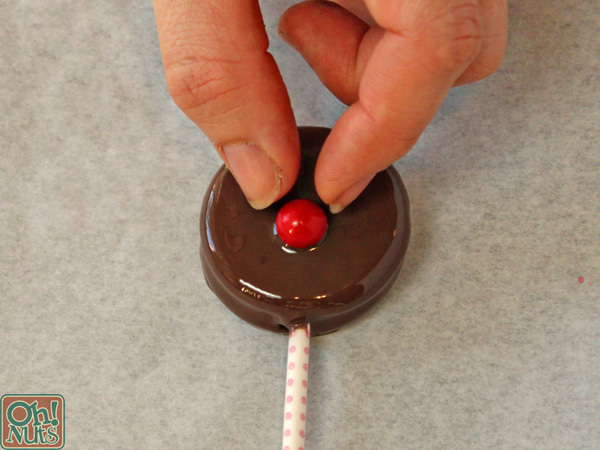 Dip the tip of a lollipop stick in the melted chocolate, and carefully insert it into the center of a sandwich cookie, so that it extends up at least 1/2-inch. Place it on a baking sheet lined with parchment or waxed paper, and repeat until all of the cookies are skewered. Refrigerate the tray for 5-10 minutes, until the chocolate is set. If necessary, briefly re-warm the coating in the microwave until it is smooth and fluid. Dip a cookie in the chocolate until it is completely coated, then hold it over the bowl so the chocolate can drip back down. Lightly scrape the bottom of the cookie on the lip of the bowl, to remove any excess, then place the dipped cookie back on the baking sheet. While the coating is still wet, press a red sixlet into the center of the cookie. Place two white chocolate chips above the sixlet. 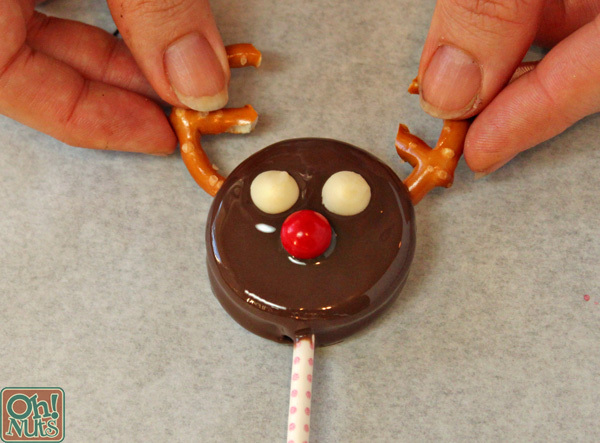 Add two pretzel antlers, angling them between the cookies and into the space where the cream filling is. Repeat until all of the cookies are dipped and decorated. Refrigerate the tray to set the chocolate completely, for about 20 minutes. 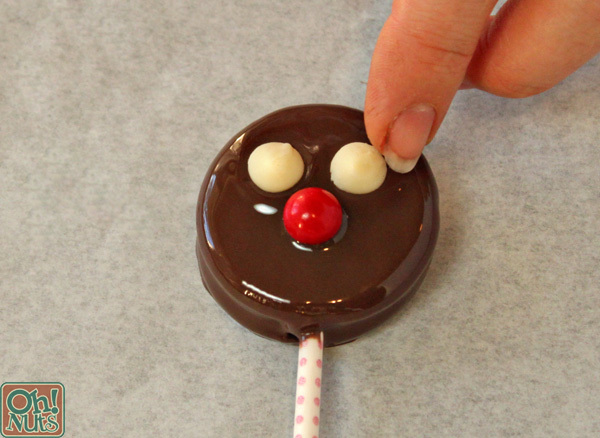 Store Oreo Reindeer Pops carefully in an airtight container at room temperature. They will keep for several weeks, but for the best taste and texture, enjoy them within a week–the cookie and pretzels do start to taste a little stale after that.